With the spotting of the yet-to-be-unveiled TECNO W5, Tecno mobile is bent on ensuring we get to see a new android phone that can compete favorably with its long-time rival, Infinix mobility every month. In September, it was Tecno Phantom 6 and Phantom 6 Plus that went live and in October, the Tecno Camon 9, an addition to the Tecno Camon C9, C8, and C7, C5 that was unveiled. Coming with better specs, bigger screen, slim body with metallic frame and 4G LTE support, the TECNO W5 android phone is an upgraded addition to the TECNO W series that shows a family resemblance which will complement Tecno W4 and Tecno W3 to unify Tecno product portfolio. Considering the latest 4G LTE trend in the Nigerian telecommunication industry that saw Etisalat, Glo, MTN, Smile promising a super fast internet, with Airtel looking good at joining soon, Tecno Mobile is presently ensuring it makes the most out of it with the upcoming device. Unfortunately, the W5 won’t support band 28, Glo 4G LTE network. 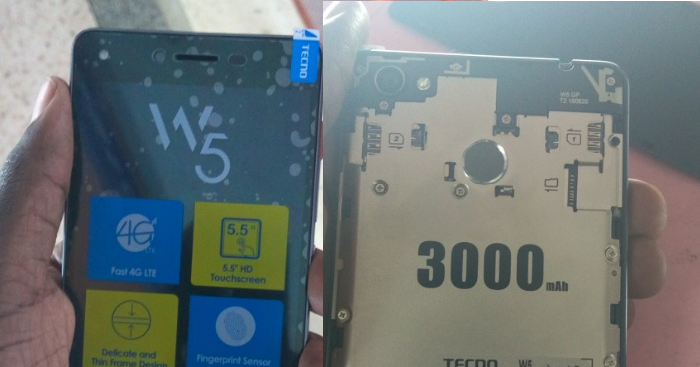 The TECNO W5 is going to launch with Android 6.0 Marshmallow out of the box, 5.5 inches display, 16GB internal memory + 1GB Ram. Fingerprint ID support, 13Mp rear camera, and 5MP front-facing camera. 1.3Ghz processor and yes it is 4G LTE supported. No word from Tecno yet on release date but this is just the beginning but considering how news like this ends in the past, we are certain it will be anytime soon. The 4G enabled network is really great. Keep it up Tecno and continue dishing out affordable phones for many. The fingerprint scanner is nice tho. Very affordable smartphone with great value.